Folding hand saw is one of the best tools in my garden toolkit, and its structure is similar to a folding knife. I bought my folding saw (Silky GOMBOY 240) even I already have two others (not folding ones). I can hang it right on my belt or put it in my pocket when I do gardening. I use my folding hand saw not only for pruning trees branches but also making small wooden objects or cutting PVC pipe when I repair water system. The folding hand saw is also an indispensable tool in the backpack of adventure travelers who often explore the wind nature. I’m not an adventure traveler, but I like gardening and DIY (do it yourself) works and folding hand saw is helpful. I searched quite much and studied to buy a best folding hand saw. I know you may get confusing like me before. There are hundreds of types of folding hand saw in the market; you will have to spend hours for reading the specification and compare the products to recognize the best one before you can decide to purchase. I’m here to save your time. Let me share my reviews below, and it will help you to determine what the best folding hand saw is for you instead of wasting time for reading and comparing, then get the confusion. What is the best folding hand saw? I guess you have grasped the essential criterions and know which are important to determine the best folding hand saw. In next step, we will go to see some further info in order to pick out the final one you want to bring home. Since there are a ton of folding hand saws are sold on the market, we will not go into details of each particular product but move on my quick reviews based on criteria below, and you can read the specification of the product when you order yours. The best folding hand saw – in my opinion – is Silky GOMBOY 240. Many users and I appreciate the products from Silky, and I think you don’t need to doubt about the quality of a product comes from Japan. Silky produces not only high-quality products but also provides you many options which can fit your needs. There are six groups of folding hand saw from Silky, you will have many options of size and aliasing density to choose. There is one point you should notice that Silky produces both straight and curved folding hand saws but the ones with curved blade do not present on the market (at the publishing time). GomBoy: Silky Gomboy has straight blade and handle, plastic-coated grip with small dots. There are two sizes teeth – medium and large, the model available with four sizes (in mm): 210, 240 270 and 300. BigBoy: There is only one size of blade length 360mm with plastic-coated handle. Bigboy model available with 3 types of aliasing – large, medium and fine. PocketBoy: This folding hand saw has a short handle which is slightly bent, your hand will get comfortable while holding it, you can find two length sizes of the blade – 130mm and 170mm. There are four types of aliasing – large, medium, fine and extra fine, this should be the specific edition for finer cut and aesthetic ensuring. Katanaboy X-large: the largest folding hand saw (at the publishing time) allows you operate with two hands, and it has a super long blade with 19.8-inch length (about 500mm). Katanaboy X-large comes with carrying case, and you can take it over your shoulder. It is suitable for cutting the big trees and sturdy wood. Super Accel: this is the only Silky folding hand saw with a curved handle, it has 210mm length blade with large aliasing. This saw supports two adjustable angles in operation. I’m using a GomBoy and this is the best folding hand saw in my opinion. 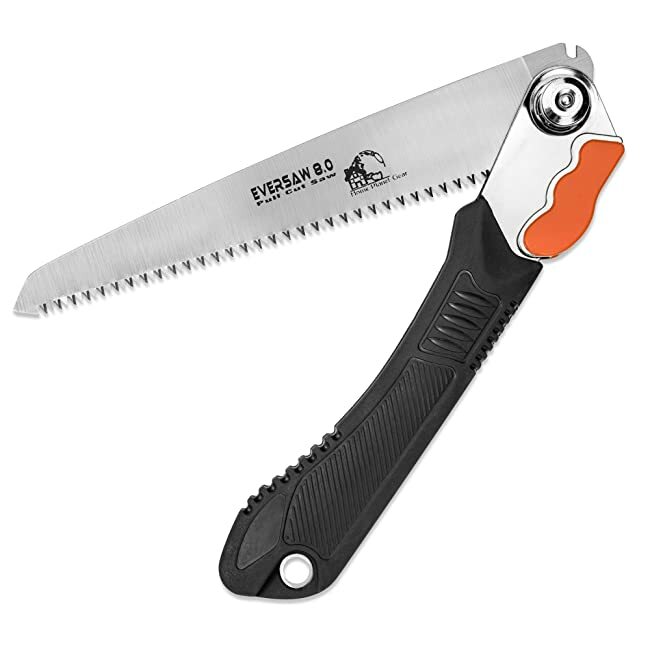 EverSaw 8.0 Pruning is one of the best seller in folding hand saw category. It is rugged and beautiful, rubber-coated handle with wavy grip help you to hold it easier, steel locker keeps the blade in a proper position when you use it. 8 inches blade with 9 TPI (teeth per inch) produces a smooth cut make EverSaw 8.0 being one of the best folding hand saws for a gardener who wants to use it for twigs trimming. EverSaw 8.0 has a fairly cheap price versus to its benefit. As I mentioned at the beginning of this guideline, we have folding hand saw with framed handle which can protect your hand from hurting or injuring when you fold the blade. It should be the safest model for you. You can find on the market this kind of folding hand saw from brands like Kisstaker, Lanier, and Truper. Tactix: If you have eve bought a tool box, you should know about this manufacturer that produces tool box products mainly, folding hand saw seems a testing product of this company to jump in this field of market. This can be a good option for you. Curved handle + curved bladder: plastic buckle, curved handles help the cut surface textured looks more impressive, curved and bladder will be able to make full use of gestures cutting cycle because the two will be slightly curved so when folded gong cumbersome. Curved handle + straight bladder: Ridge after going straight cut, curved handle to help push and pull when cutting easier, closing with steel hooks. This is The cheapest one from ARS. Straight bladder + handle: closing more certain metal, rubber coated handle with multiple holes to help hold stronger, better friction, straight up when folded will be leaner. The most expensive one. Corona: From my point of view, it seems weak and prone to loose after sometimes of use. Fiskars: Fiskars produces 5 products in 2 groups – foldable and sliding, this is the only brand produces sliding folding hand saw as I know. Currently, at the publishing time, we have 2 new release folding hand saw. AvaHoga: the newest folding hand saw producing by AvaHoga from Japan with a reasonable price, it’s appreciated with mostly 5 stars rating. First of all, you should know about the main factors of a folding hand saw to determine the one suitable to your needs, then you just go to see the detailed specifications and price, then place your order. Sounds good? You are looking for a foldable blade saw; hence, the size or the length of the blade and handle should be the first factor to consider. If you want to use the saw for cutting small branches of your trees, and putting it in your pocket or backpack, you should get a short and small one. If you use it to cut the thick and large trees or pieces of wood, a long and hard blade folding hand saw should be your choice. There are following sizes (in mm) of folding hand saw presents on the market: 160, 210, 240, 270, 300, and 360. I am using a medium size 240mm. There are two basic types of shape of handle and blade: straight and curved. The folding hand saw with straight handle and blade will be smaller than the curved one when you fold it. The one with a curved blade will contribute quicker cut. The curved handle will help to cut easier since you can transfer all your thrust and traction from your hand to the saw. Most of the folding hand saw blade are carbon steel, and you can sharpen it with a steel file. Otherwise, you can replace by a new blade when it being worn. Another thing to be considered is the blade locker. You should choose the one with steel locker instead of plastic as the plastic locker will be broken easier than a steel one. Usually, the grips are rubber or plastic coated with wavy or dotted surface help you to hold the saw easier. Some saws have framed handle (for instance) which can protect your hand from hurting or injuring when you fold the blade. There are four levels of aliasing size: large, medium, fine and extra-fine. The large size and low-density aliasing saw will help to cut faster, but you have to use more muscle power for thrust and traction, the cut surface will be rough. If you trim twigs, it may scratch the bark near the cutoff point. Your work will be slower with a small size and high-density aliasing one, but only slight thrust and traction is needed, you will get a smooth cut surface, it’s good for twigs trimming. My GOMBOY has a medium level of aliasing with 7 TPI (teeth per inch) density. Many users (even me) appreciate the quality and the variety of products from the Silky manufacturer from Japan. I am using a 240mm GOMBOY from this company, and I am very satisfied. I strong recommend you to use folding hand saw product from Silky, but the others are also options to consider. The color is not an important factor indeed, but there are many manufacturers are paying their attention to the visual of their products and producing colorful folding hand saws. Most of the saws have a black-orange combined color. Let’s choose a saw with your favorite color to have more fantastic when you use it. I do not mention about the price factor here since the criterion of cheap and expensive is decided when you buy and use the your saw. I can say that price of a folding hand saw is not too high, and it doesn’t prove that the product is good or not. For me, the best folding hand saw is the one fit to the user’s needs, not the largest nor most expensive one.the new size uses, hence my choice is Silky GomBoy, and I am very satisfied with it. How about you? Have you found the saw you need? If yes, then see the details specification and price, then purchase. I always prefer and suggest you buy the product at Amazon to get the best product, quality assurance as well as warranty and secure payment. Don’t push too hard when cutting to avoid broken or bent the blade. Always clean your saw after using. Better wipe the blade with an oil-soaked cloth to prevent the blades be rusty. – There are following sizes (in mm) of folding hand saw: 160, 210, 240, 270, 300, and 360. We also offer 130, 170, 500 and 650 mm! – There is one point you should be noticed that Silky produces only straight blade folding hand saw, not curved blade one for you. There is Ultra Accel curved with a curved blade. There is also a BigBoy2000 with a curved blade and a new line of curved bladed Gomboy’s! Hi, thanks for your notice, I did update the article with accurate information according to the products available on Amazon. Feel free to give your further advices if any.